Often referred to as “the blue planet”, the majority of the Earth consists of aquatic ecosystems. Human land-use change, over-exploitation and pollution have severely impacted aquatic ecosystems over the past decades. In order to protect and maintain central ecosystem services obtained from aquatic ecosystems, such as clean water and food, conservation actions have been proposed in order to protect and preserve our planet’s water ecosystems. Bioassessment and continuous monitoring are the central tools to evaluate the success of conservation management actions. However they are not efficient enough at the moment. The DNAqua-Net project, funded under the European framework COST, is set to gather a large international professional community from across disciplines and fields in order to develop best practice strategies for using novel genetic tools in real-world bioassessment and monitoring of aquatic ecosystems in Europe and beyond. The grant proposal, authored by a large international team, is published in the open access journal Research Ideas and Outcomes (RIO). Currently, biodiversity assessment relies on morpho-taxonomy, meaning species are identified based on studying the morphology of collected and manually sorted specimens. However, this approach is largely flawed due to being time-consuming, limited in temporal and spatial resolution, and dependent on the varying individual taxonomic expertise of the analysts. In contrast, novel genomic tools, meant to be researched and developed over the course of DNAqua-Net, offer new solutions. They rely on DNA barcoding to identify species, even those undescribed yet, and assess biodiversity of water ecosystems using standardised genetic markers. DNA barcoding is a modern taxonomic tool, which uses short standardised gene fragments of organisms allowing an unequivocal assignment to species level based on sequence data. 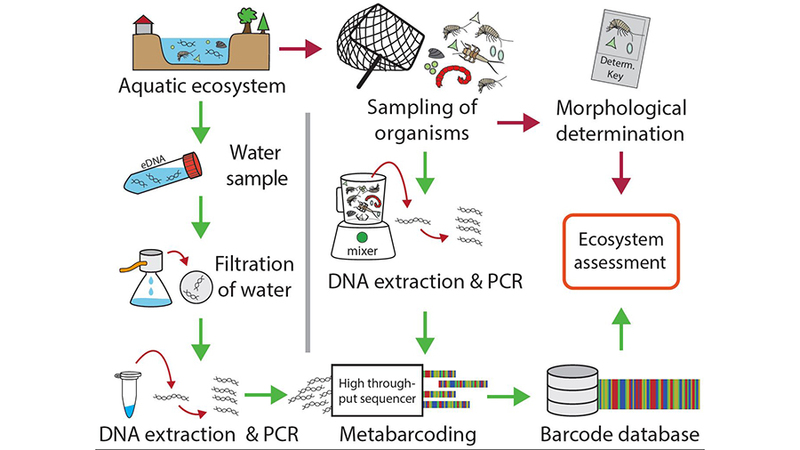 Standardised DNA-barcode libraries, generated by the international Barcode of Life project (iBOL), and its associated and validated databases, such as BOLD and R-Syst provide reference data, which make it possible to analyse multiple environmental samples within a few days. So far, a major problem in developing and adopting genomic tools has been that scientists have been working independently in different institutions rather unconnected from end-users. However, the DNAqua-Net team’s aim is to establish a cross-discipline, international network of scientists, managers, governmental institutions, manufacturers, and emerging service providers. Together, they would be able to identify the challenges in DNA-based bioassessment and provide standardised best-practice solutions. Furthermore, as technological progress continues, DNA does not have to be necessarily extracted from tissue, but can also be collected from sediments, biofilms, or the water itself. Also called ‘environmental DNA’ (eDNA), it can provide information on much more than a number of specifically targeted species. Instead, it could deliver data on the entire biodiversity of micro-, meio- and macro-organisms living in an aquatic environment. While being far less invasive than traditional sampling techniques, the combined eDNA metabarcoding approach could also detect alien species and thus, act as an early warning for management. “Novel DNA-based approaches currently emerge, possibly acting as a “game-changer” in environmental diagnostics and bioassessments by providing high-resolution pictures of biodiversity from micro to macro scales,” comment the authors.